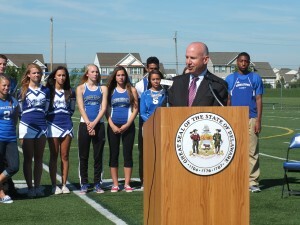 Middletown, DE – Surrounded by student athletes from Middletown High School on the first day of school, Governor Markell signed legislation that requires the Delaware Interscholastic Athletic Association (“DIAA”) to draft regulations to identify symptoms and risk factors of sudden cardiac arrest in student athletes. The legislation aims to better identify at-risk students who participate in youth sports and raise awareness among coaches and administrators. Senate Bill 205, which notes that Sudden Cardiac Arrest is the number one cause of death of student athletes while participating in practices and games, also helps ensure schools are better prepared to respond quickly and effectively should an incident occur. Governor Markell spoke about Senate Bill 205, relating to procedures for dealing with Sudden Cardiac Arrest in student athletes. As a result of this law, the Delaware Interscholastic Athletic Association will develop rules for schools to deal with awareness, recognition, and management of sudden cardiac arrest in student-athletes. At a minimum, each school must give coaches and officials information on sudden cardiac arrest, including warning signs. In addition, students and their families will need to sign a sudden cardiac arrest information sheet; athletes will answer questions about heart history before they participate; and schools will ensure all head coaches undergo CPR certification that includes training on the use of an automated external defibrillator. 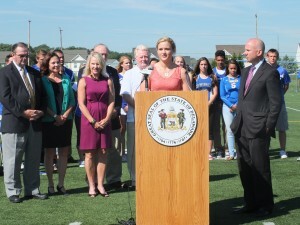 Bill sponsor Sen. Bethany Hall-Long, D-Middletown, said the law reinforces actions already being taken by the Delaware Interscholastic Athletic Association. Hall-Long, who authored a law requiring screenings for athletes who may have suffered a concussion, has been on the forefront of protecting the health of young athletes. Sen. Bryan Townsend, D-Newark, co-sponsored the measure, which he hopes will protect young athletes. SB 205 is known as the Grace Firestone Act, named for a former three-sport star at Tower Hill, who also excelled in the classroom, exemplifying the value that athletics can have as part of the educational experience. Now Grace, who attended the bill signing, is one of the rare survivors of Sudden Cardiac Arrest, having collapsed in her home two days after her high school graduation. Grace Firestone is a student athlete and survivor of Sudden Cardiac Arrest.